More than a week after President Donald Trump was sworn into office, special Inauguration Day-only Metro passes are still arriving in the mail for people who ordered the cards before Metro’s stated deadline. WASHINGTON — More than a week after President Donald Trump was sworn into office, special Inauguration Day-only Metro passes are still arriving in the mail for people who ordered before Metro’s stated deadline to receive the passes in time. 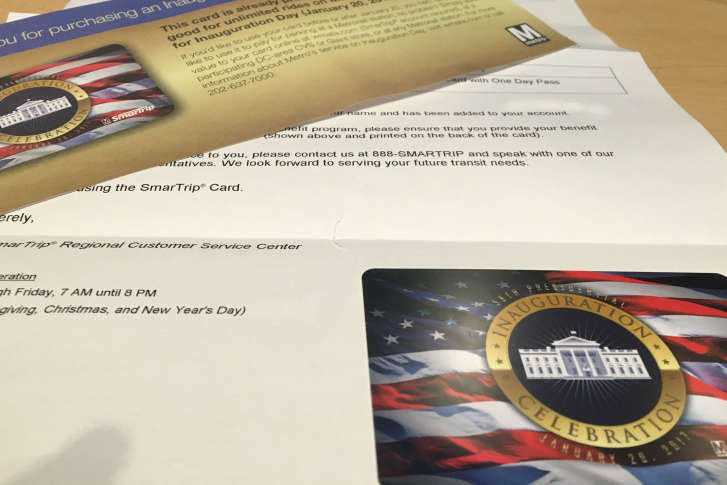 Several of the envelopes containing SmarTrip cards ordered before Jan. 13 — which Metro said was the final date to order and get a commemorative card with the special discounted pass in time — were not postmarked until Jan. 24. It is not clear how many people or orders the issue has impacted. Metro spokeswoman Sherri Ly said the agency has only issued about 500 refunds “in the week following the inauguration” out of the approximately 47,000 cards sold in all. More than half the cards — 28,864 — were sold online in advance, while the rest were sold in person at local stores or at stations on Inauguration Day. The cards are no longer listed as available on Metro’s online SmarTrip store. Greg Gorham, of the Manassas area, said he received a card in an envelope postmarked Jan. 24, a week after the date on an order slip inside. He did not actually receive the card until a week after Inauguration Day. Several WTOP reporters did not receive the cards until early this week. Jon Glaser, a University of Maryland student, said he had placed five different orders for a group on five different days, and still did not receive the cards until Jan. 23. Those cards were postmarked Jan. 18. The cards ordered online ship from a suburb of Cleveland, Ohio. While the commemorative cards can be used like regular SmarTrip cards going forward, the special pass riders paid for was only valid on Inauguration Day so that value was lost. Anyone who did not get the card in time can request a refund of the full $10 paid for the card and pass by calling SmarTrip customer service. Metro announced the design of this year’s special Inauguration Day SmarTrip card in late December, much later than in 2012 when separate designs for then-presidential candidates Gov. Mitt Romney and President Barack Obama were unveiled in October. It is also a month later than in 2008 when a design for President Obama’s first Inauguration was unveiled about two weeks after the election. The 2009 Inauguration was the first time Metro issued a specially designed inaugural SmarTrip card, and at the time Metro said there would be a limited supply due to the amount of time it took to print and ship the cards. The card this year did not feature Trump’s picture. Instead, the card that ended up being sold to the public simply noted the “58th Presidential Inauguration Celebration.” Metro handed out free commemorative sleeves with Trump’s photo on them on Inauguration Day, a memento like the one issued when Pope Francis visited D.C.